In 2012, Christopher left on a third trip around the world, this time with his motorcycle Puck. Together with his partner Laura Pattara, they travelled for four years from Europe to Australia. 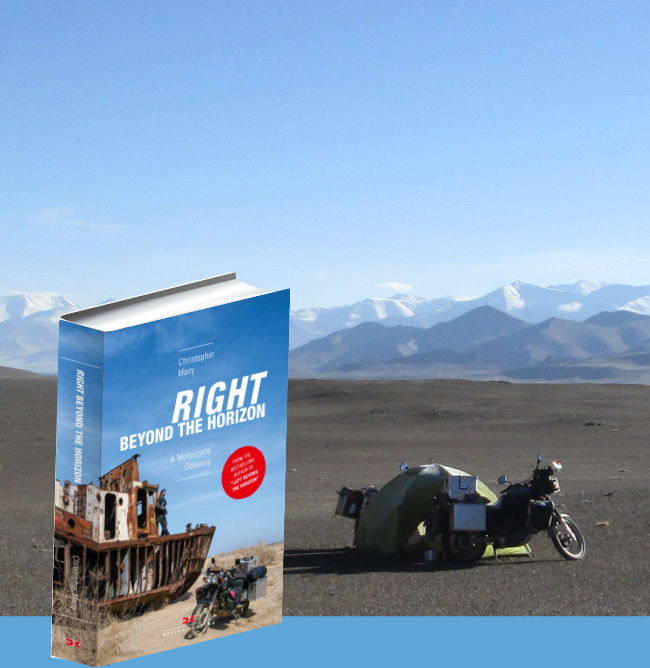 His new book Right Beyond the Horizon – A Motorcycle Odyssey tells the story of his most recent adventure. In 2002 Christopher Many set off on his second overland journey: a round-the-world voyage with an ailing Land Rover he purchased in Scotland for USD 1000 (or GBP 700). 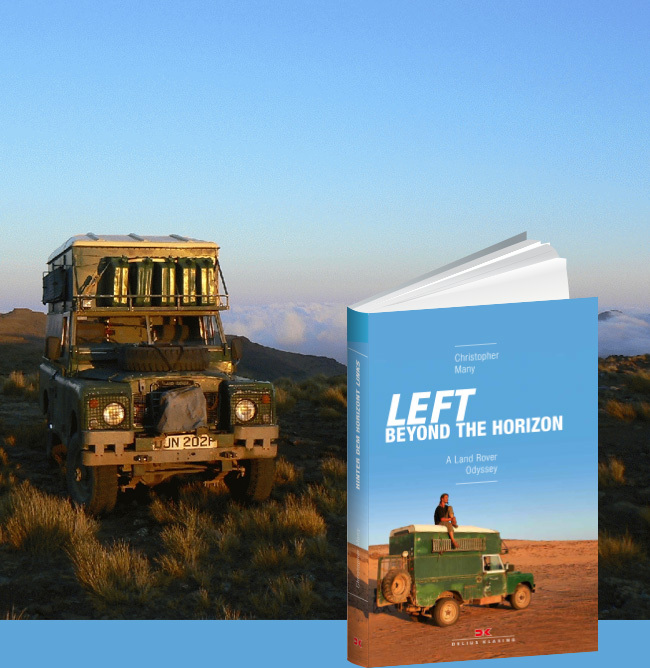 He named the Landy Matilda, and for the next eight years, they travelled through 100 countries. 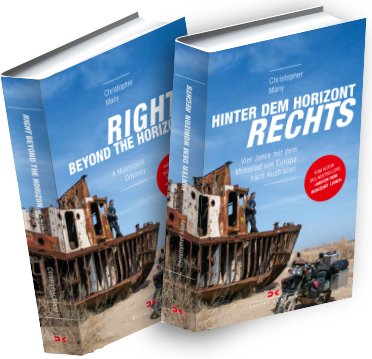 His bestselling book about this Odyssey, Left Beyond the Horizon, was published in 2015. When people say “life’s a journey”, some take this aphorism more literally than others. Christopher Many embarked on an overland trip in 1997, believing he’d spend no more than a year or two on the road. Well, that didn’t quite work out as planned – 20 years have passed, and he’s still somewhere out there, doing what he loves most: circumnavigating the globe with vehicles of questionable reliability in a quest to understand, through first-hand experience, what makes humanity “tick”. May 2017: Christopher and Laura are currently in Australia. To follow the voyage, see photos from the road and hear about Christopher’s books, Left Beyond the Horizon and Right Beyond the Horizon, please click here. 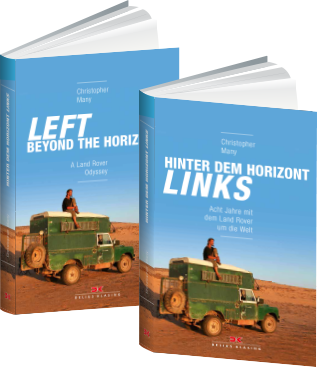 Whether you enjoy motorcycle or off-road 4x4 adventures, globetrotting and outdoor camping, or simply love travel writing and have a keen interest in current global affairs ... Christopher Many’s overland books are just what you have been looking for! The bestselling author went on an eight year trip around the world with a Series 3 Land Rover, and recently, rode from Europe to Australia with his Yamaha motorcycle. Read all about his experiences in Asia, North and South America, Africa and more!